The third day of Syria settlement talks in Geneva focused mainly on the issue of opposition delegation unification, while the whole negotiations process was overshadowed by terrorist attacks in western Syrian city of Homs, killing over 30 people and injuring dozens. MOSCOW (Sputnik) — The fourth round of UN-backed intra-Syrian talks between the government and opposition factions began on Thursday. The discussions are expected to center around governance, constitutional issues and elections in Syria. Security sources in Homs told Sputnik early on Saturday that six suicide attackers had targeted two buildings belonging to the Syrian government’s security agencies. Talal Barazi, the governor of the Homs province, said that a total of 32 people had been killed and 24 injured as a result of the attack. UN Special Envoy Staffan de Mistura called the attack a "tragic event" and a "spoiler" to the peace process in Geneva, and expressed hope that this terrorist attack would not affect the course of the talks. "It was a tragic event. I'm expecting during the talks unfortunately spoilers. Every time we had talks there have always been spoilers," de Mistura told reporters. Bashar Jaafari, the head of the Syrian government delegation said the attack was a "message" to the Syrian reconciliation process, adding that the message was received and it would not be "left like this." "What happened today casts shadow on Geneva process. It was also a political attack," Jaafari added. 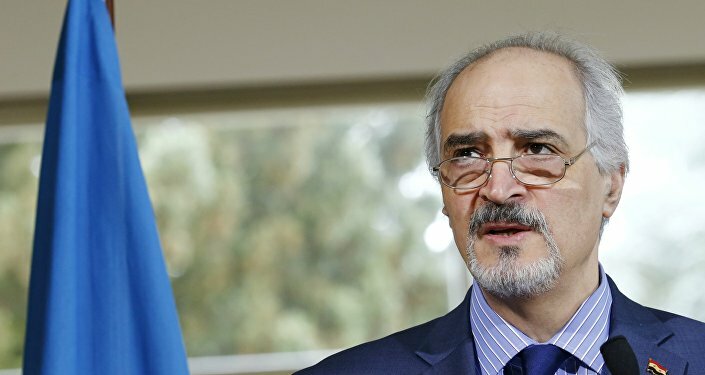 Jaafari also requested the UN special envoy to ask all opposition platforms to condemn terrorist attack in Homs claimed by al-Nusra Front terrorist group, outlawed in Syria, Russia and some other countries. 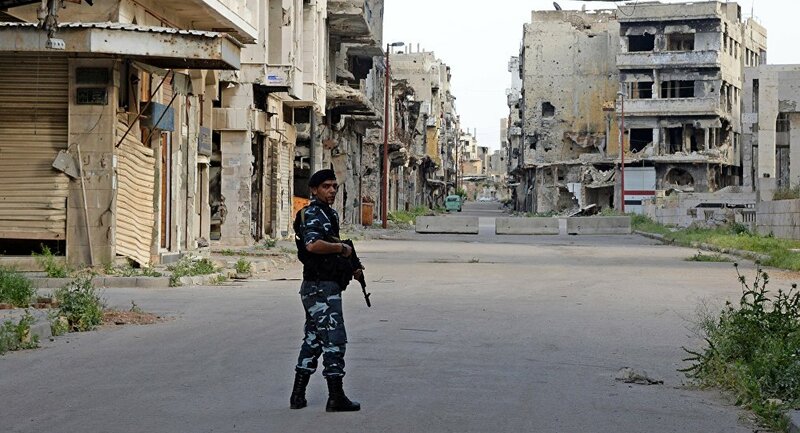 Leader of the Cairo group Jihad Makdissi condemned the attack, highlighting that the aims of al-Nusra Front had "nothing to do with the legitimate ambitions of the Syrian people." "Nusra Front is a terrorist organization and it is also recognized [as such] by the international community, and we adhere to this classification. We condemn all their actions, and it is necessary to fight with them," Makdissi told Sputnik. Meanwhile, HNC delegation condemned all terrorist attacks, adding that it considered itself to be the victim of terrorism, according to HNC delegation member Fatih Hassoun. On Friday, de Mistura gave a procedural paper to the delegations of Damascus and the HNC with his proposals for the current round of Syria talks. According to a Sputnik source, the UN special envoy expressed his support for direct talks and also suggested focusing on three main topics — governance, constitution and elections, while leaving the issues of ceasefire and the fight against terrorism for Astana-format negotiations. De Mistura's proposal triggered more disagreement between the parties, as Damascus considers counterterrorism efforts to be extremely important, necessary to discuss on all tracks. "The issue of counterterrorism must be dealt with in Astana, in New York, in Geneva, on all tracks. 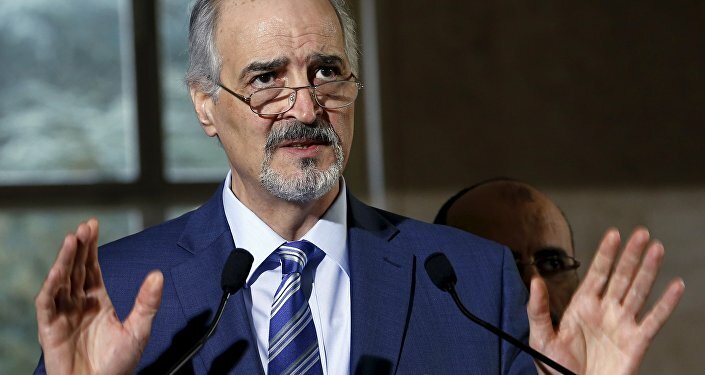 This is a priority on the agenda," Jaafari told reporters on Saturday, adding that the Syrian government believed in the negotiation process in Astana, Kazakhstan, brokered by Russia, Turkey and Iran. HNC head Nasr Hariri characterized Syrian government delegation's fixation on anti-terrorism issues at the ongoing Geneva settlement talks as means to shun away from discussions on political transition in the war-torn country. "[UN Special Envoy for Syria] Staffan de Mistura said first he wants to focus on political transition. We expected Jaafari to be that tough, because of what happened today…. But the thing that regime does not accept is transition. Their accusations are not real," Hariri told reporters. Ah the same time Hariri highlighted that the Syrian opposition was committed to combating terrorism, adding that it "was the first one to condemn terrorism." 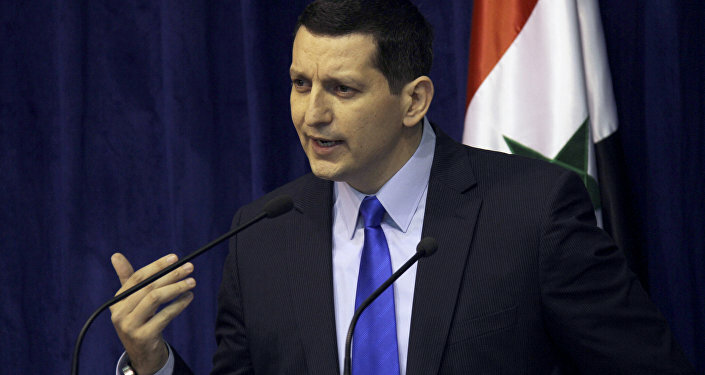 HNC spokesman Salem Muslet also blamed the Syrian government delegation at the Geneva talks for its readiness to discuss only the issue of fight against terrorism and desire to avoid raising other issues, stressing that Geneva talks format was actually created to discuss the political process. "We are all against terrorism and we know how to fight against it in Syria. This issue was discussed in Astana. However, here in Geneva, the government representatives are making terrorism a cornerstone issue. They want to discuss only fight against terrorism and avoid other issues," Muslet told Sputnik, adding that Damascus could not fight against terrorism, as it was "creating terrorism in Syria and committing crimes against the Syrian people." As Syrian opposition is represented by several separate delegations, including High Negotiations Committee (HNC), the Moscow platform and the Cairo platform, the unification of the opposition is one of the key issues for the ongoing negotiations in Geneva. A hope for such a possibility emerged after de Mistura gathered together all the parties to the talks during a welcoming speech at the official opening ceremony of the conference. However, the issue of the unification remains open so far. On Saturday, HNC head Nasr Hariri said that the HNC delegation was ready to form a single delegation with the other platforms, adding that the talks with the Cairo platform were ongoing, despite a failure to reach agreement on Friday. "The HNC has no problems of communicating with other opposition platforms to reach a proper formula," Hariri told reporters. HNC delegation member Bashar Zoubi confirmed to Sputnik that the issue of unification of the HNC with the Cairo opposition platform delegation remained open, though, it was unlikely that the Moscow platform would join the unified delegation at the intra-Syrian talks. "For us as for, the HNC delegation, this issue is not closed, however, those, who want to join the talk, should have some certain positions. If they agree with such conditions, as, for instance, the resignation of [Syrian President Bashar] Assad and so on… Maybe it is Cairo [platform]. We have the common ground. The Moscow platform is far from that point. However, if they accept these position, we will have no problems," Zoubi said in an interview. Meanwhile, Qadri Jamil, the leader of Popular Front for Change and Liberation and the platform, told Sputnik Saturday that the Moscow platform was ready to start talks with the HNC on possible unification of their delegations stressing the necessity to create the delegation involving all platforms. "We are fully intent to unify. There are no any conditions. Our only requirement is to make this entity fair in order to avoid such cases when a delegate can be excluded or when there is a superiority of one delegation over others," Jamil said, adding that no specific decision had been taken yet. As regards the Syrian government, Damascus is ready to sit at the one negotiating table only with such a unified opposition delegation, which condemns terrorism, according to the delegation's head Bashar Jaafari. "We have only one condition to sit with one unified patriotic opposition that we can see as a partner… Opposition that condemns terrorism and does not work for foreign agenda," Jaafari told reporters after a meeting with de Mistura. The current Geneva negotiations followed the talks in the Kazakh capital of Astana, where Russian, Iranian, Jordanian and Syrian delegations had a number of technical meetings, with ceasefire monitoring being one of the main issues on the conference’s agenda. 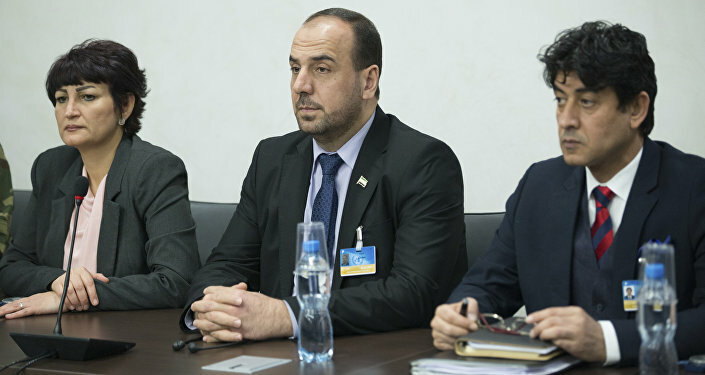 The HNC of the Syrian opposition positively assessed the Astana talks and expressed a belief that the ceasefire issues could also be discussed in Geneva in addition to the politics-focused agenda. "Astana is a good process if it achieves something. Especially the confirmation of the ceasefire. It is viewed positively by HNC. If it will be discussed here as an additional basket, it is fine," HNC adviser Yahya Aridi told Sputnik Saturday. Committee's spokesman Salem Muslet urged Russia, as one of the ceasefire guarantors, to take a well-balanced position and use its opportunities to exert pressure upon Damascus and Tehran. "Russia’s position must be balanced, we do not want it to bend over to the opposition or remain on its position supporting the regime. We want it to bend to the Syrian people’s side. The people of Syria are suffering, and we are hoping that these sufferings will end. Six years are enough, and the price is very high. Russia should put pressure on the regime, it could do this and exert pressure on Iran and its armed groups. We need to stop the death of the Syrian people," Muslet told Sputnik. As regards elaboration of a new constitution, member of HNC negotiators' team Bashar Zoubi believes that the constitution should not be discussed during the ongoing Geneva talks. "The constitution is not in the sphere of government's or opposition's responsibility. It is the right of the Syrian people. If somebody from the opposition or some people from government or other countries want to impose constitution on the Syrian people, then where is the democracy and freedom, which we are talking about?" Zoubi told Sputnik. HNC adviser Yahya Aridi, though, told Sputnik the issue of the constitutional reforms should not be abandoned, but transition should be discussed first. The HNC also called on holding direct talks in the presence of an international mediator in order to expedite the process of confirmation of all sides' real intentions, according to Muslet. "We have demanded holding the direct talks in the presence of an international mediator. We demanded this at Geneva 3 and ahead of Geneva 4… The direct talks, which we seek, will save the time and guarantee the real intentions of the sides," Muslet told Sputnik. Meanwhile, opposition delegation member Zoubi pointed out that the prospects of settlement of the Syrian crisis depended on Russia and the United States.